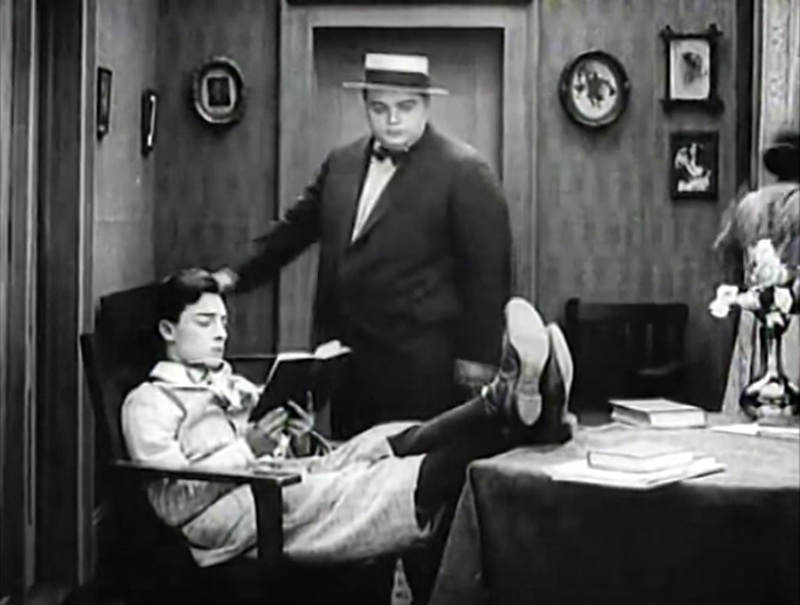 This comedy directed by and starring Roscoe (Fatty) Arbuckle is also an early vehicle for Buster Keaton, who plays his spoiled and immature son. While a bit rough around the edges, there is some good physical and situational comedy here. The Vamp and Al now formulate a plan to get the expensive necklace they saw Arbuckle’s wife wearing. 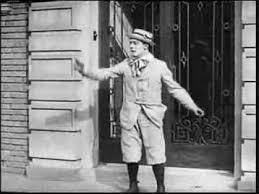 She calls him and says she has swallowed can of shoe polish, so Arbuckle agrees to make a house call. Along the way, he sees a man selling a “miracle soap” that will prevent all illness. Worried about losing business, Arbuckle sets his car on automatic and sends it plowing through the crowd, then hands out business cards to the injured spectators. He whistles and the car obediently returns like a dog. Then, he finally goes to the Vamp’s apartment, where he fixes martinis for both of them from the supplies in his doctor’s bag. Meanwhile, Al has appeared at Arbuckle’s house pretending to be a patient, and is able to steal the necklace from around the wife’s neck without her noticing. Buster sees him getting away, though, and follows him back to the Vamp’s apartment, calling his mother and letting her know what has happened. Now, Al and the Vamp have to get Arbuckle out of the house, so they send him to a bookie with another hot tip. He puts in the bet, but then goes back. There is a series of comedic close-encounters as Al avoids Arbuckle, Arbuckle avoids his wife, and the wife tries to get back her necklace. Then Arbuckle finds a police uniform in the kitchen and puts on a false mustache, using it to intimidate Al and retrieve the necklace. At this point, Buster shows up with several more policemen, and Arbuckle bluffs his way past them by pretending to arrest his wife. Then he tries to collect his winnings from the bookie, but they all run away at the sight of his uniform. He takes his money anyway, but his wife gets the last word. Contrary to his “Old Stoney Face” standard of later years, Keaton in this movie emotes with powerful facial expressions, laughing uproariously and bawling at the slightest provocation. 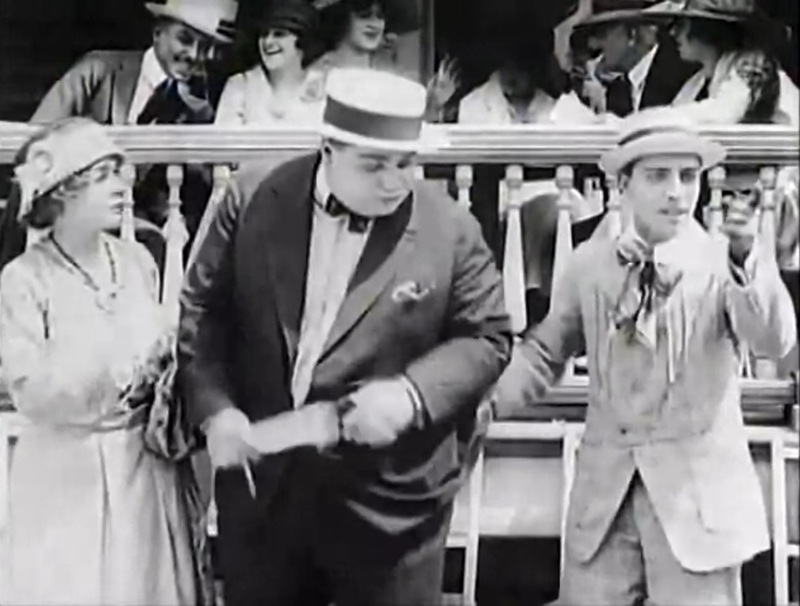 The comedy is a bit more “situational” than most of what we associate with Keaton and Arbuckle, but they both get in plenty of pratfalls as well. Keaton, in particular, does an impressive tumble backwards over a table to land comfortably in a chair. I suspect that Arbuckle (who directed) had told him to cry so frequently, thinking that it would be good comedy, but I found that it made the relationship seem more abusive and less funny. Overall, I wouldn’t rate this as the best work either actor has done: I spent a lot of it waiting to see what Keaton or Al St. John would come up with next. The biggest laugh Arbuckle got from me was when he started handing out business cards to the people he had injured. This year marks the 100th anniversary of Buster Keaton’s entry into film comedy, and this blog post marks my entry into the “Buster Keaton Blogathon,” which has been running now for three years. For the next few years, we’ll be able to track Keaton’s development, as we have with Chaplin over the past few. He definitely showed physical ability and screen presence right from the moment he got started, even if he honed and refined his talent as he gained experience. I’m looking forward to getting to know Buster as this project develops. Now go check out the other entries in the Blogathon! No matter what he does, I just cannot resist liking Buster on the screen! And seeing all those emotion fly for once…makes it just all the better for me!! Thanks for reading and for sharing your thoughts! He’s definitely one of the best parts of this movie, even if it doesn’t work that well for me. Excellent look at the film. Not one that has a great appeal for rewatching, but certainly one worth seeing in the grand scheme of Fatty and Buster’s world. Thanks for reading! I look forward to charting Buster’s progress from here. Hi popegrutch. This movie did not make much of an impression on me when I watched on the Kino set. Buster’s emotional displays are distrubing and you are right, they make the father-son relationship seem abusive. I guess Buster had to re-learn the lesson that a straight face is funnier. Thanks for an interesting review. Thanks for reading! For Buster, I guess we all have to start somewhere, but I would also say that Arbuckle is a bit disappointing here. It may have been uneven direction that led to Keaton’s over-emotional approach. The latest Buster shorts set has a pretty nice, complete print so I’ll have to rewatch it a couple times and see if it strikes me any differently. Thanks for covering this, glad you got to contribute this year! Thanks for hosting! 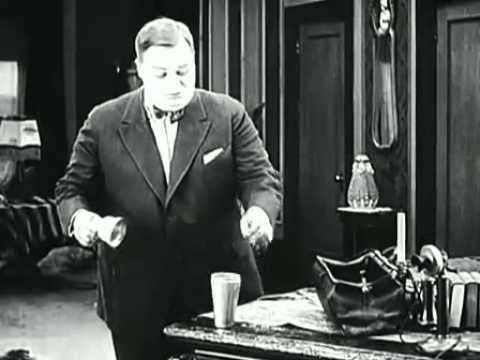 I feel like Arbuckle was best when he played a lovable goof, but he often seemed to wind up in these more unsavory roles, I guess because that’s what “slapstick” meant at the time, or maybe he wanted to stretch or something. I hadn’t thought of Keaton’s role here as similar to Al St. John, but you might have a point. With Al, I think, it would’ve been funnier, partly because his whole body language would have been more extreme. And, having covered Chaplin’s early career over the last few years, it’s easy to compare this to some of his less-effective early roles, as in “Mabel at the Wheel” or “Making a Living.” In both cases there’s a noticeable potential there, but they just don’t seem to have found themselves yet. Keaton at least gets that one great tumble in! I love how this ends, with Roscoe’s ill-gotten gain spilling out of his overcoat! It’s weird to see Buster Keaton in this type of emotional role. I agree that it’s not his best work, but he did what the character needed. Yet, it’s great to see Keaton in these early roles. Thanks for reading as always. You have a point in Keaton’s defense: he’s definitely doing what he’s supposed to here. The character wouldn’t really make sense as a stoney-faced child. The ending is a nice touch also.